With the sun just peeking over the Eastern horizon on a brisk September Saturday morning, I coaxed 455 cubes of Pontiac power to life, engaged drive and pointed my ’74 Grand Prix SJ west toward Illinois. The late summer sun was still low in the sky and cast a long shadow ahead of the car as I was on my way, looking forward to arriving in Pontiac in time to participate in the Route 66 cruise. The 220 mile trip was uneventful with the big ‘Prix burbling along smoothly and confidently at about 2,600 rpm, temp reading just shy of 180 and oil pressure at a steady 60 PSI. I didn’t worry about packing my toolbox as I naively thought I had finally gotten most of the bugs out – this was going to be a fun trip. 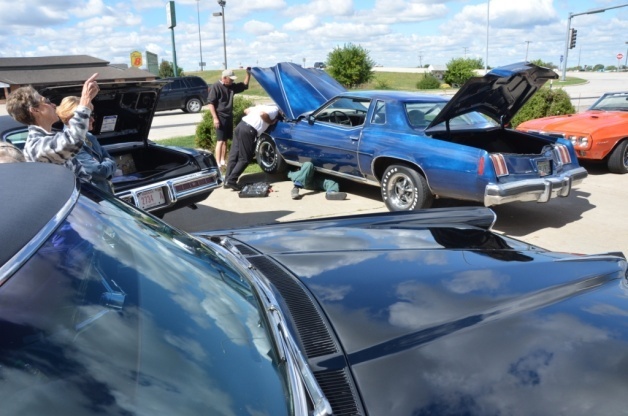 I arrived in Pontiac just after 11:00 local time, so I filled the 25 gallon tank & planned to join the other Pontiacs then lining up for the cruise. With $80 worth of dead dinosaurs in the tank & my body relieved of used coffee, I thought I was all set. Turning the key dictated a revised plan with the all too familiar sound (to vintage Pontiac owners, at least) of a starter that was dying a quick death, turning over very slowly and then stopping with a sharp click of the solenoid. It was now 11:20, so I called Prez Mark Pataluch who was leading the GP brigade on the cruise. The next thing I knew Mark & Kay had broken away from the pack (a great Pontiac Break-Away!) and rolled into the gas station followed by Ron & Nancy Maurer and Hank & Mary Kollross. Ron produced a test lamp and was probing key electrical circuits in my car. After pronouncing my electrical system OK, Ron, Mark, Hank & I rolled the 4,200-pound ’74 up on a curb and Ron dove under the car & had the starter dropped within 5 minutes. He then proceeded to confirm that my 2-month old Duralast starter was cooked by jumping both the solenoid and the starter motor itself directly to the battery. I have to say that I was especially glad to have just completed refurbishment of my car’s engine compartment – nobody got greasy working on it! There was an AutoZone 1/4 mile away that didn’t have a vintage Pontiac starter (in Pontiac, IL of all places…?! ), but the one 25 miles away did. Long story short, I ‘borrowed’ my ’07 Solstice back from Tim Dye at the museum, drove to Streator and exchanged my starter under warranty, got lunch (at 3:30!) and put the GP back together with the tools Ron & Mark left for me. I have to hand it to the residents of Pontiac – in the 30 minutes it took me to install the starter, no fewer than six locals including a Pontiac Police Officer offered their garages, lifts, jacks, tools, supplies and whatever else I needed to get the car running. Fortunately, the tools I had were more than adequate to get the starter bolted back in & spun the 455 so fast I thought the spark plugs were gone – telling me my other starter must have had a problem out of the box. I parked the car at the hotel and headed to Chautauqua Park in the nick of time to catch Ben Harrison’s GTO presentation. 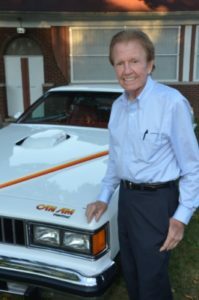 Ben was Pontiac’s Product Development Planner for 17 years and his stories and slides of GTO, Grand Prix and Can Am development were entertaining & informative as always. Ben’s presentation was capped with a dinner & ice cream social compliments of the City of Pontiac. 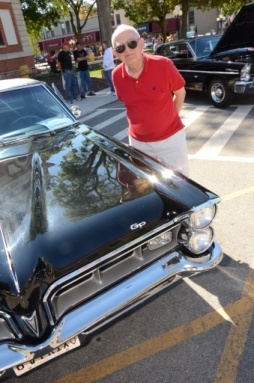 Retired GM designer Paul Deesen also made an appearance at this year’s event – he was particularly smitten with The Schaudek’s triple-black ’65 GP as his sketches set the design parameters for the grille and the “upper” roof section of that car. Both men were especially impressed with the town, the people and the cars present over the weekend. Sunday dawned clear and beautiful and downtown Pontiac was ready. The courthouse square was blocked off and quickly filled with 184 of the finest Pontiacs from all over the Midwest. Pontiac/Oakland Automobile Museum Director Tim Dye summed it up beautifully, “Walking outside and seeing all of those cars parked around the square made it feel like an outdoor extension of the museum!” A popular vote was held along with picks from Museum, Mayor and club. 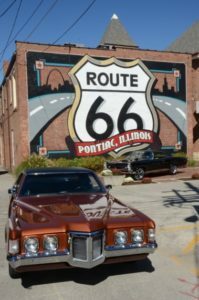 As participants & dignitaries roamed around the square, they no doubt discovered the numerous murals painted around town – most notably the Route 66 sign behind the 66 Museum complete with a brick driveway for snapshots of cars parked beneath. 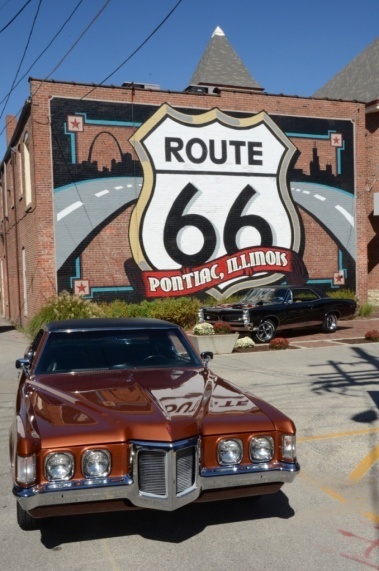 This mural is fast becoming one of Pontiac’s signature landmarks as it’s all over the Pontiac online forums and has appeared on an Illinois tourism TV spot. Some of the artwork is a bit more mobile. Chinese airbrush artist Tang Dongbai dressed up a white ’95 GP with a depiction of Pontiac history (the city, not the marque). 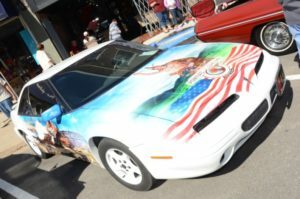 The car was parked on the square right in front of a sidewalk mural he did of a shark breaking through the cement.